There's something about the simplicity of a clean, white shirt. Its literally a blank canvas, so it seems to offer a form of style salvation. There are endless possibilities in how you wear it and I like that. I also like the hint of subversive, just-rolled-out-of-my-boyfriends-bed-ness about it, which contrasts with the freshly pressed and buttoned up look. 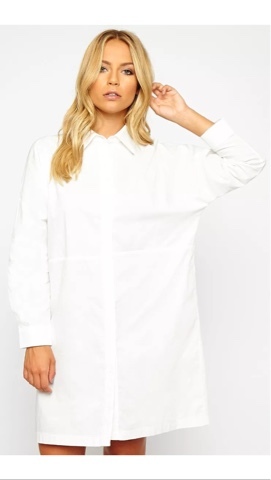 Ive been hunting for the perfect oversized white shirt for what feels like years now. Everything I could find was too fussy or too feminine. Then I came across this gorgeous specimen from online shop Pretty Little Thing. My heart leapt! It was a good length (Im tall so I have to be mindful of shirts falling too short), a very clean silhouette, full length sleeves and a proper collar. Exactly what Ive been searching for. This outfit is everything. Total #wardrobegoals for me. Exactly how I would want to dress in a universe where I never sacrifice style for comfort or have baby sick down my top! I just love everything about this minimal, chic ensemble. The black leather biker jacket adds structure to the fluid lines of the shirt. The simple black clutch gives sophistication. And the strappy heels add edge. Of course, the acres of slender bronzed leg are an essential too! I am literally going to copy this outfit the second I can. A different take on the shirt, here its worn as a tunic with black skinnies or leather leggings, which is another look I love. The informality of the shirt is smartened up and made office-appropriate with a businesslike black tote bag and minimal sandals. This outfit has inspired me to see how I could style my shirt dress for work. I think it would also work with black opaques, patent loafers and a blazer. This ensemble lets the shirt shine. It shows how it can be made into a great summer piece with flat gladiators and a casual cross body bag. Theres something so easy breezy about the styling here. This would look incredible for summer in the city and I think swapping out the black accessories for tan ones on a beach break would also work really well. Olivia P is the master of uptown style, and Im in love with her unexpected take on the shirt. She layers a monochrome cropped sweater over the shirt with the collar peeking out, and adds a pair of staple black ankle boots and a slash of colour with that eye catching scarlet bag. This would make a great look for autumn or winter with the addition of knitted tights. It goes to show an oversized shirt can work as well for the cooler months as it can in the summer. A great way to instantly change up the oversized shirt is to belt it. This instantly makes it much more of a feminine look by adding in curves and shape. Theres something very cute about pairing it with the cream panama hat, which is already a summer staple of mine. I think theres a very preppy vibe here which is enhanced by her Louis shoulder bag as well. More of a polished, grown up take on the oversized shirt. 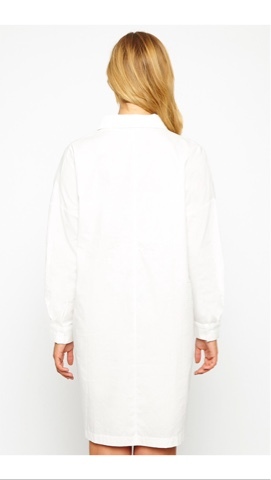 This last take on the long shirt would be so good for coffee with friends or shopping. The dress is smartened up by the addition of a grey felt fedora and matching peep toe ankle boots, plus I love the rolled sleeve detail. A classic black tote also adds gravitas to the lightness of the look. Polished and simple - a perfect look. So the long white shirt is a versatile staple that can be left casual or smartened up and made to work for any season - a true British classic and an item I think every wardrobe needs.